THIS POLL IS NOW CLOSED. THANK YOU FOR PARTICIPATING. 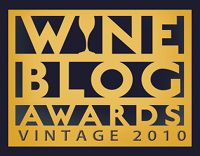 Thank you for participating in the public voting for the 2012 Wine Blog Awards. The voting period will run July 18 - 26. Please carefully read the criteria and vote for one winner for each award category. If you are not familiar with each finalist, we suggest you spend the time to review the blogs so you can make an informed decision. Your vote is important! Criteria: 1) Should present a compelling visual experience for readers using original graphics, photography, or works of art, both throughout the site format and in individual posts. 2) Should demonstrate the potential of the blogging format to convey ideas or subject matter through images. 3) Should have made an extra effort to present its subject matter in a highly visual and graphic manner that is both entertaining, educational, and thought provoking. Criteria: 1) Should have wine reviews as the primary content on their blog. 2) Should consistently deliver insightful and well-presented wine reviews. 3) Should have made an extra effort to use wine reviews to educate their readers. 4) Should heighten the reputation of the wine blogging genre for providing excellent consumer advice. Criteria: 1) Should have as the focus of the blog a single, relatively narrow subject such as a country, a single appellation, a single varietal or type of wine, retailing, wine tourism, one aspect of the business of wine or any other narrow focus that seeks to consistently illuminate that specific single subject. 2) Should demonstrate a command of, or expertise in, the single subject upon which it focuses. 3) Should be among the best sources of information in any genre for information on the chosen subject matter. Criteria: 1) Should have done an outstanding job of using the blog format to convey the unique nature of a working winery. 2) Should have used the blog to create a more intimate connection between consumers and the winery. Criteria: 1) Should put the English language to great use. 2) Should write with a demonstrably original voice that conveys a personal style. 3) Should consistently demonstrate a command of the English language to convey original, insightful and entertaining messages. Due to an unfortunate error, we left out one finalist on the list of Best New Wine Blogs. To correct this, we have canceled the voting that occurred to date and reinstated the voting for this category only at a new survey at http://www.surveymonkey.com/s/WBA12BestNew. Please copy this URL and fill out that survey after you have completed this one. We apologize for the inconvenience. Criteria: 1) Should continually produce entertaining and educational information. 2) Should contain well-written prose and well produced posts. 3) Should demonstrate independent and original ideas and insights. 4) Should be of such high quality overall it can compete with any other wine information resources in any other medium. 5) Should be able in its overall form, content and presentation to advance the reputation of the wine blogging genre.